Recently, the historicity of Ursula's story has come under serious questioning, as it seems her legend is unsupported by history. 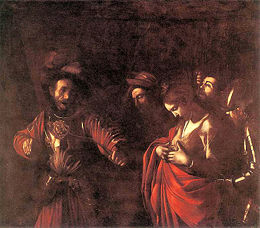 Literary critics theorize that an ancient tradition about the martyrdom of several unnamed virgins of Cologne by Roman authorities was combined with an unrelated legend about a British princess named Ursula and her companions, who were blown off course and massacred by the Huns and Picts in northern Germany, but not in Cologne. The nature of Ursula's story and the legendary status of her character has caused her role in the history to be downplayed significantly. 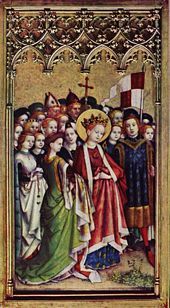 Saint Ursula's feast day in the Catholic tradition is October 21, but she was officially removed from the general calendar of saints in 1969. A certain Clematius, a man of senatorial rank, who seems to have lived in the Orient before going to Cologne, was led by frequent visions to rebuild in this city, on land belonging to him, a basilica which had fallen into ruins, in honor of the virgins who had suffered martyrdom on that spot. Even the authenticity of this inscription is debated, but there is no reason to doubt that the tradition of virgins being martyred at Cologne is very ancient. The inscription also testifies to the existence of a previous basilica, dating perhaps from the beginning of the fourth century in Cologne. However, the inscription does not indicate the number of the virgins, their names, or the date and circumstances of their martyrdom. No other written trace of these martyrs is found again until the ninth century, when a preserved sermon speaks of several thousand martyrs who suffered persecution at Cologne during the reign of Diocletian and Maximian (late third century). One of these martyrs is named, Pinnosa. The martyrology of Wandalbert of Prüm, compiled about 850 also speaks of several thousand virgins, while the martyrology of Usuard, written around 875, mentions "Martha and Saula with several others." None of these mentions anything about Ursula or about Huns. But by the beginning of the tenth century, the phrase "11,000 virgins" begins to appear. Thereafter this number is accepted, as is the British origin of the saints, while Ursula becomes their most important member instead of Pinnosa. The experiences of Ursula and her 11,000 companions soon became the subject of a pious romance which acquired considerable celebrity. Two ancient versions of the legend are known, both originating at Cologne. One of these (Fuit tempore pervetusto) dates from the second half of the ninth century (969-76), but was only rarely copied during the Middle Ages. The other (Regnante Domino), also compiled in the tenth century, had a wide circulation. The author claims to have received it from one who in turn heard it from the lips of St. Dunstan of Canterbury, who was the archbishop of Canterbury in the tenth century. According to this account, Ursula, the daughter of a Christian king of Great Britain, was betrothed in marriage to the son of a great pagan king. Desiring to remain a virgin, she obtained a delay. At her request she was given as companions ten young women of noble birth. She and each of the ten were accompanied by a thousand other virgins, and the whole company, embarking in 11 ships, sailed for three years. When the appointed time was come and Ursula's betrothed was about to claim her, a gale carried her and the 11,000 virgins first by water to Cologne and then to Basel, then to Rome. There, their piety and the purity of their faith moved the supposed Pope Cyriacus to join them on a pilgrimage. They finally returned to Cologne, where they were slain by the pagan Huns in hatred of their Christian faith and feared its spread in their lands. The writer of this version seems to be aware of a Gallic legend found in the later writing of Geoffrey of Monmouth (twelfth century), according to which the Roman Emperor Maximian, having conquered Brittany, sent 100,000 colonists there from Great Britain together with 30,000 soldiers. He placed the territory under the government of the Breton prince Conanus Meriadocus. Lacking adequate females, Conanus decided to bring young women from Great Britain to marry his subjects. He appealed to King Dionotus of Cornwall (otherwise unknown), who sent him his daughter Ursula, accompanied by 11,000 noble virgins and 60,000 other young women. A violent storm destroyed some of the ships and drove the others to barbarian islands off the coast of northern Germany, where they were slain by the Huns and the Picts. Geoffrey's account is considered by modern scholars to be inaccurate and anachronistic, but the earlier third century story of virgin martyrs on which it is based may in fact be the origin of the legend of Saint Ursula. In the twelfth century, not far from the Church of St. Ursula in Cologne, skeletons of women, children, and men were unearthed, causing great excitement and giving rise to various local legends and visions. These played an important role in confirming the supposed connection of the story of Ursula and her 11,000 virgins to Cologne. However, the skeletons are now thought to be merely the remains of people buried in a churchyard dating back to Roman times. Meanwhile, the absence of a Pope Cyriacus in the pontifical records was explained by the supposed fact that his name was erased from the records by his cardinals, who were displeased by his abdication to follow Ursula on her pilgrimage. Historically, Cyriacus was the name of a martyr that died at Rome about 80 years before the story of Ursula's martyrdom at Cologne. The legend of Saint Ursula resulted in her veneration throughout Europe until fairly recently. The cult of Ursula and the 11,000 virgins was widespread, reaching as far as India and China. The twelfth century abbess Hildegard of Bingen composed several chants in honor of Saint Ursula. Many churches and shrines were dedicated to her. Christopher Columbus named the Virgin Islands after Ursula and her virgins. On October 21, 1521, Ferdinand Magellan rounded Cape Virgenes and entered the Straits of Magellan, naming the cape after Ursula's virgins. The Order of Ursulines, founded in 1535 by Angela Merici, especially devoted to the education of young girls, helped to spread the name and the veneration of Saint Ursula throughout the world. 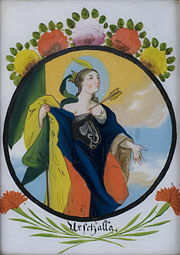 As a result, Ursula was named the patron saint of students. She is also traditionally considered the patron of the British Virgin Islands, Catholic education, the city of Cologne, educators, holy death, schoolchildren, teachers, and the University of Paris. The legend of Saint Ursula inspired a host of works of art, several of them of the high artistic value. The most famous of these include paintings of Ursula by Hans Memling, Caravaggio, Hans Holbein (the younger) and the old masters of Cologne. 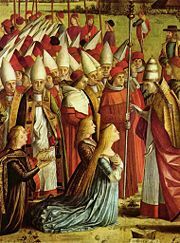 Today the story of Saint Ursula is overwhelmingly considered to be fiction, and as a result in 1969 Pope Paul VI suppressed her cult as part of a larger revision of the Catholic canon of saints. This article incorporates text from the 1913 Catholic Encyclopedia, a publication in the public domain. This page was last modified on 10 August 2015, at 19:36.